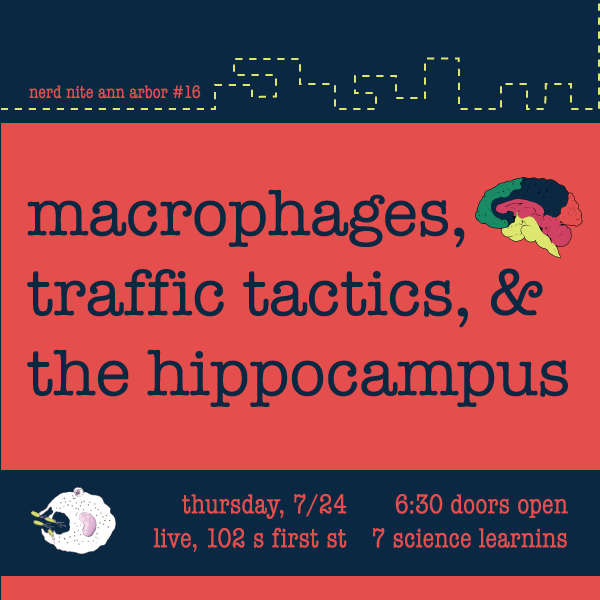 Macrophages, Traffic Tactics, and the Hippocampus! Get the skinny on under-appreciated “sentinel” cells called macrophages, pick up tricks to boost your errand-running efficiency, and investigate something called Growth Factor X’s role in the brain – is it truly a hero or a villain? Join us for a special super-science edition of Nerd Nite, featuring speakers from the University of Michigan’s RELATE program. 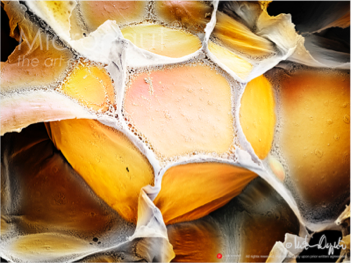 Grab a drink, bring a friend, and immerse yourself in some of the research being done right in our very own fair city. When: July 24th, 2014, doors at 630pm, talks at 7pm! Gabriel is from Southern California and is currently a PhD student at the University of Michigan, where he studies obesity and the immune cell components involved in the development of Type II Diabetes. When not in lab, he likes to grow things in the garden, read about international cuisine, and discuss the merits of jam. The talk will address the issue that when trying to pick the right order in which to run errands sometimes things do not go as planned due to traffic congestion. 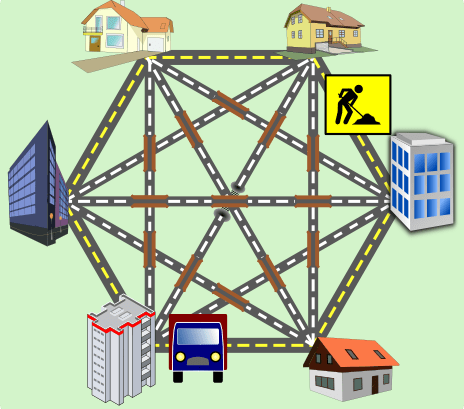 I will talk about under which conditions it is better to start reconsidering those decisions and more generally highlight what happens if traffic jams start interfering with a previously well planned sequence in which to visit locations of interest. Moritz received a German diploma in aerospace engineering from the University of Stuttgart, Germany in 2010. After graduation he worked as a researcher at the department for unmanned aircraft at DLR (German Aerospace Center) in Braunschweig, Germany. In August 2012 he joined the University of Michigan as a graduate student. His research focuses on stability analysis for solutions to integer optimization problem and its application to mission planning for unmanned aircraft. Elyse L. Aurbach – Growth Factor X: Superhero or Villain in the Depressed Brain? I’ll be talking about the role of two members of the fibroblast growth factor molecular family in major depression. 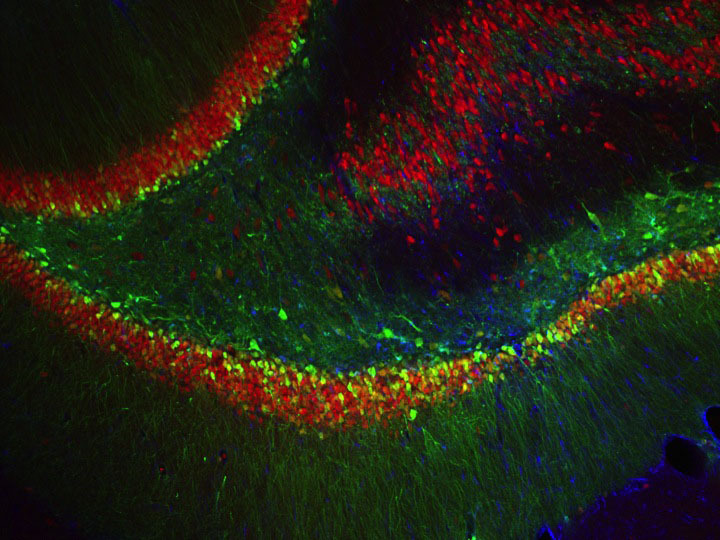 In the hippocampus, a region of the brain critical for memory and emotion, these growth factor molecules become disrupted after stressful experiences. These changes may affect the way the hippocampus functions during health and during depression, so studying them may help the medical community to develop more effective treatments for mood disorders. Elyse is a grad student studying the neuroscience of depression at UM (which isn’t as depressing as it sounds). When not obsessing over experiments, grammar, or her cat, she coordinates RELATE (Researchers Expanding Lay-Audience Teaching and Engagement) with collaborators Katie Prater and Leah Bricker. A relatively recent transplant to the Midwest, Elyse dreams of building igloos and catching fireflies.